Now that I have stopped following food bloggers who promote junk foods, my Instagram feed is clean with some yummy and healthy homemade food-related posts. I heaved a sigh of relief for a few weeks, but junk food promotion in the form of “sponsored posts” have started showing up more often. Is it that more sponsored posts are appearing on Instagram these days? Anyway, instead of whining, let me see this as an opportunity for new blog post ideas. Most of us who grew up in the 80s/90s are aware of Bournvita, “the malted health drink” targeted towards growing kids. 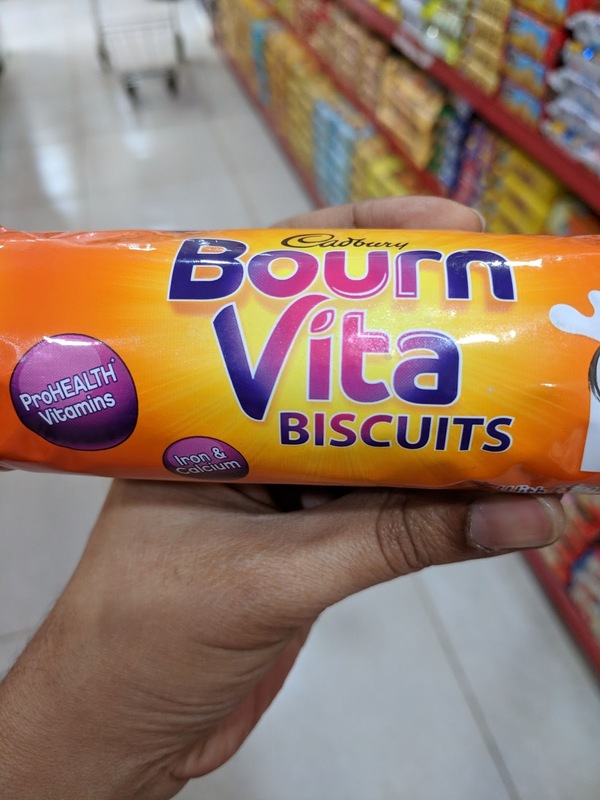 The biscuits variant of Bournvita is the one that caught my attention through an Instagram sponsored post. 1) Have you heard of fruits like banana, guava, orange, apple etc? They are small, very healthy and can be easily carried to school. 2) Have you heard of dishes like idli, poha, paratha etc? They are home cooked, very healthy and easy to carry to school. 2) The second listed ingredient is sugar. 100 gm of these biscuits contain 30 gm of sugar. Serving size is 23 gm (roughly 5 biscuits), which contains around 7 gm or nearly 2 tsp of sugar. These biscuits are very light that a child might end up eating more than 5 biscuits. 3) The third listed ingredient is Palmolein Oil. All packaged foods use this cheapest oil that is highly refined and processed. 100 gm of these biscuits contain 15.3 gm of fat. 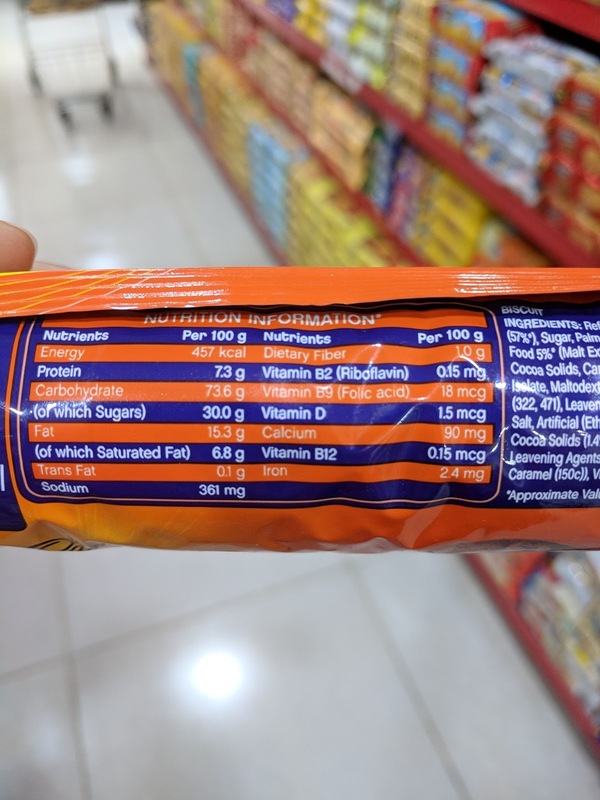 Serving size is 23 gm (roughly 5 biscuits), which contains around 3.5 gm or nearly a tsp of unhealthy fat.And yes, this pack contains transfat as well. 4) The ingredients list goes on with various additives - emulsifiers, leavening agents, maltodextrin, artificial flavours etc. 1) Calcium - 90 mg per 100 gm of biscuits. For a serving size of 23 gm (roughly 5 biscuits), it contains a meagre 20 mg of calcium. 2) Iron - 2.4 mg per 100 gm of biscuits. For a serving size of 23 gm (roughly 5 biscuits), it contains a minuscule amount - 0.5 mg of iron. 3) Dietary Fiber is insignificant (1 gm per 100 gm of biscuits). 4) ProHealth vitamins listed in this pack - Vitamin B2, B9, B12 and D are so tiny and insignificant that it is only a clever marketing tactic to capture the attention of health conscious parents. Moreover, why do we need such synthetic vitamins and minerals in the first place, when we can get significant nutrients from grains, pulses, fruits and vegetables? Parents who are reading this, your child needs a better, healthier snack box with real nutrition every single day. Let’s not fall for these “health-claims” of packaged foods. And they don’t need such “subah ka biscuits" to kickstart their mornings. This is the kind of rants/write ups/reviews that the Indian blogosphere is deficient of! What choice of words and detailed information that I'll gorge multiple times. I've restricted my commenting habits for the past few months on blogs but yours compelled me to. It's been years since I gave up Maggie (was unaffected when it was banned), cold drinks and biscuits completely. Such a small change makes people around me so appalled that they can't wrap their heads around it. More "Not to go into my stomach" ingredients shall follow the aforementioned. Thank you Nidhal for your encouraging words. Great to know that you read the nutrition labels on food packets and have given up junk food. That's an awesome step towards good health and wellbeing. This s really awesome.. hats off to you.. 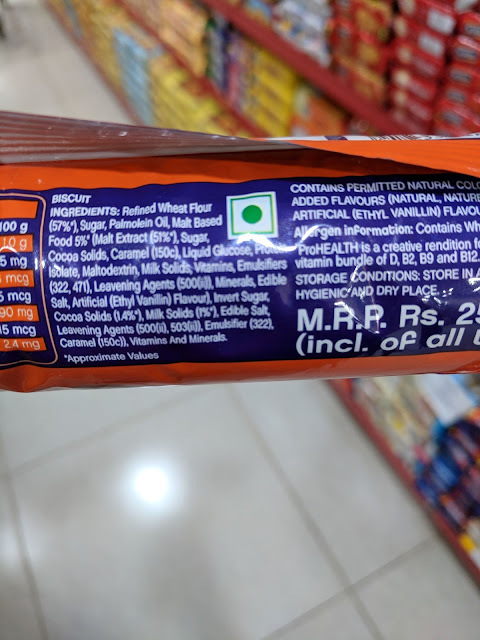 While I appreciate your work I am unable to understand how fssai declares these food as safe. Jasmine hair oil of Parachute company is80% mineral oil but shows 2 coconut pieces in the label. Maggie noodles was tested unsafe by an honest Indian in his lab. You know that the lab assigned by the courts found it safe. Next day crores of Maggie noodles were sold. The comany never said it changed anyhing. Still we have the miracle of it becoming safe in the mind of crores of people. No one is concerned! You are absolutely right, Haran. Unless we consumers shun away from such products, no regulation or any regulatory authority will look into what goes behind such products. Great post Anuradha- in fact I just saw a new ad by the brand that again is pitching this product as a breakfast for the child- the mere thought of that is appalling! I work in advertising and sometimes really wonder to what extent large corporates can manipulate so called health seeking adults to make very erroneous choices. @bikram, thank you. I just saw the latest ad. It is so manipulative that they are pitching these junk biscuits for breakfast to kids. My sister bought these biscuits as snack option between her classes. I tasted one and it was awesome! Basically the claim of healthy breakfast biscuit and their sweet taste intrigued me...this review is great! !